This page is of photographs of Bolen's Store and the first house southwest (upwind) of the store, the two buildings hardest hit by damage in the Dalewood area. 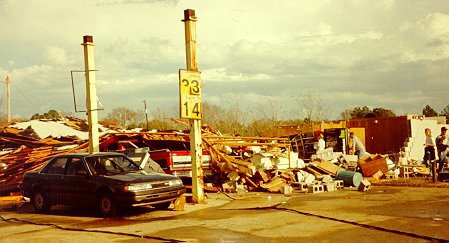 Bolen's Store was destroyed, thankfully with only minor injuries to the 2 people inside at the time of the storm. The house suffered significant damage, with half of the roof ripped off. The destroyed store. The SUV on the left had its rear window broken and a large dent in the rear door. Just to the right (in the photograph) of the SUV is a tannish sedan that was caught under the rubble of the store. The horn was blaring form this car. 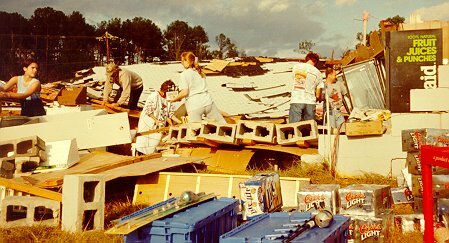 Local residents help salvage what they can from the remains of the store. 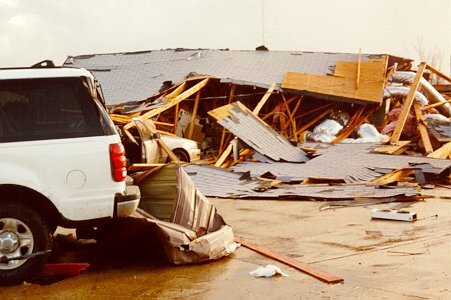 Another view, looking east-northeast, at the damage to the store. This was the first picture of the store I took, and shows the damaged sedan better. This house took significant damage, with most of the roof gone. 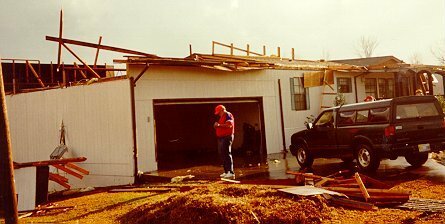 Another view of the house damage. 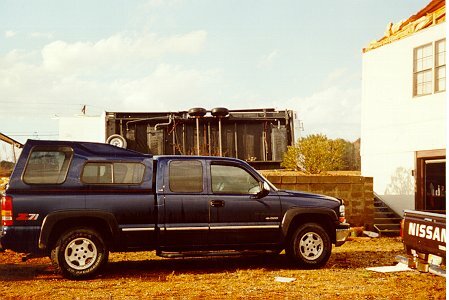 The turned-over trailer was sitting where the blue truck is before the storm hit.